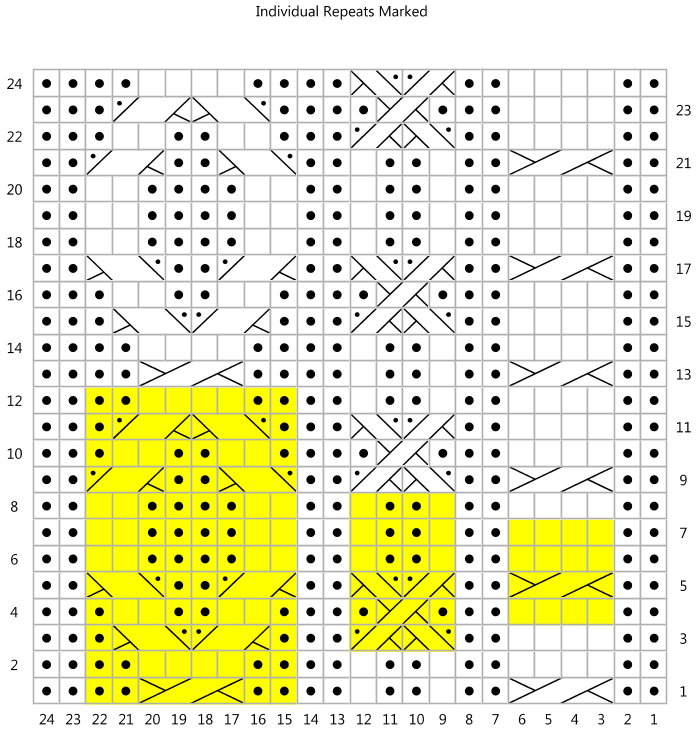 In my last column, I talked about finding stitch repeats to collapse large charts. In that situation, there was only one basic pattern motif being worked, and so there was a straightforward solution for reducing the charts. If you have more than one distinct motif, it can get a bit more challenging. 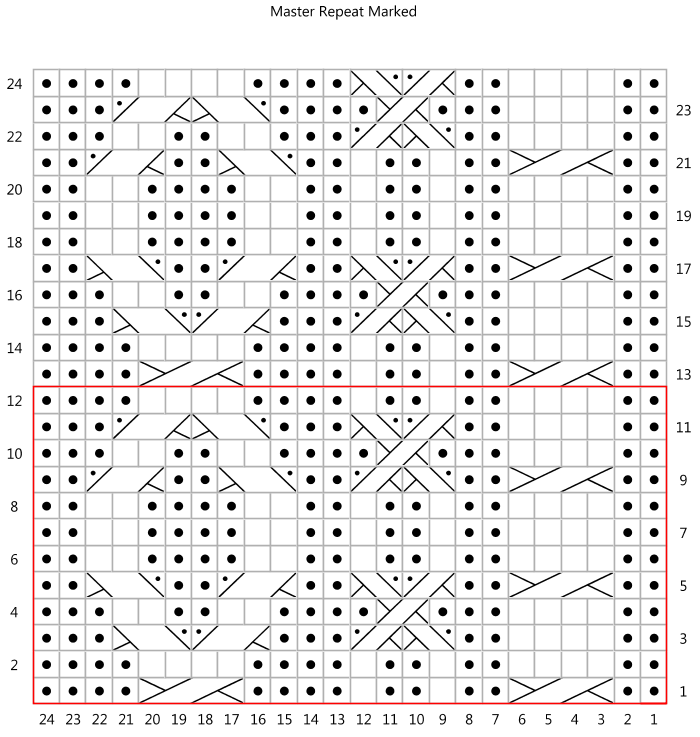 As shown, the chart is worked over 24 rows, but it’s pretty easy to see there’s repeats. The pattern on the left repeats over 12 rows, the middle pattern repeats over 6 rows, and the pattern on the right repeats over 4. But we don’t need to create three separate repeats. Because both 4 and 6 divide neatly into 12, we can create a single master repeat that captures all three. The alignment might not be immediately obvious when you first look at it, but arithmetic provides an easy clue. One repeat of the largest motif includes 2 of the middle, and 3 of the smallest. It’s actually very tidy. But I ran into significantly more difficulty when I added a fourth cable pattern in… this larger one repeats over 18 rows. I spent a minute doing some quick arithmetic: although 6 fits neatly into 18, 4 and 12 don’t. That is, three full vertical repeats of the 6-row pattern would fit nicely into the 18-row pattern, but the 4-row and the 12-row ones don’t fit. The test here is whether the number of rows in the largest pattern divides evenly by the number of rows in the smaller patterns. As you can see in the chart, 36 works nicely, though! 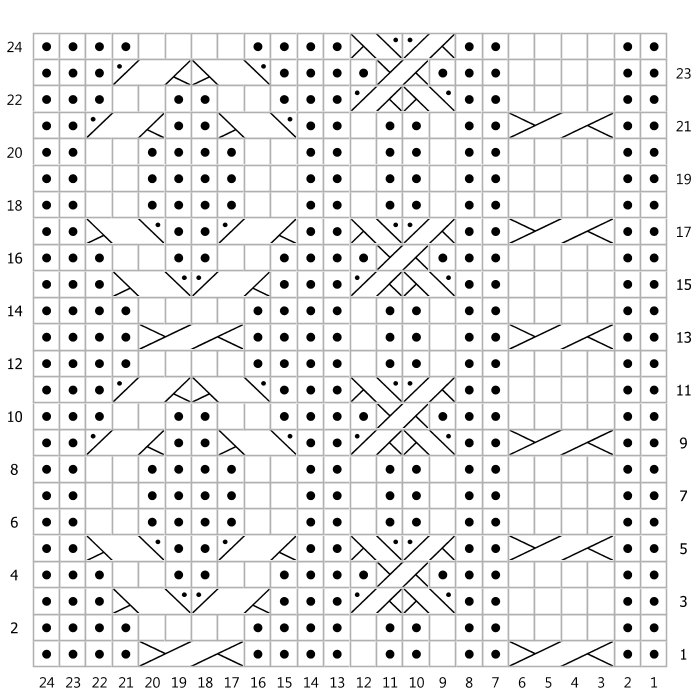 36 comprises 2 repeats of the 18-row pattern, 3 repeats of the 12-row pattern, 6 of the 6-row pattern and 9 of the 4-row pattern. What I did here was look at multiples of the largest pattern, and see if there were easy divisions available. But causes another problem: the chart is getting larger, rather than smaller. A chart of this size needs to be pretty big – likely a full page – to be legible in a printed pattern. And in my experience, a chart this size is more challenging to work from: it’s too easy to lose track of where you are, especially because the patterning is so repetitive. And a lot of my favourite cable patterns are even bigger: one of my favourites is a 28-row repeat, and that would mean that I could be looking at 58 or even 84 rows before I find something that works with other repeats. So we need to consider another strategy. Consider breaking the motifs up into separate charts. In this case, you create Charts A, B, C and D, each with a different element, with its own row repeat. Row 1 (RS): P2, work Chart A, p2, work Chart B, p2, work Chart C, p2, work Chart D, p2. Row 2 (WS): K2, work Chart D, k2, work Chart C, k2, work Chart B, k2, work Chart A, k2. I decided to leave the reverse stocking stitch dividing elements off the charts, to keep them tidy, and to make the larger logic of the pattern evident in the written instructions. Or, for more advanced knitters, you could show a single chart, but put individual repeat boxes on the individual elements. Although it feels more concise, this version isn’t necessarily beginner friendly, because a knitter may find it more challenging to keep track of where they are in the pattern… It’s not as simple as just working Rows 1-18 over and over again. Row 1 of the second repeat of the largest pattern isn’t going to line up with Row 1 of the second repeat of the smallest pattern. The advantage to this version is that you don’t need any row-specific written instructions as you do for the first version – it’s as simple as saying “Work chart across”, but you do need to make it very very clear about your intentions for the different row-repeats. This can be handled with some text beside where the chart appears in the pattern. When I’m working from a chart like this, I often just print off the chart and carry that with me (in a plastic sheet protector or, if it’s small enough, a conference badge holder!) in my knitting bag. That way, the key information and warnings are right there with me. If you put the warnings and notes in the text section of the pattern, there’s a chance they might get missed, or left behind and forgotten in the unprinted section of the pattern. There are pros and cons to both of these solutions, and which you choose is a matter of personal preference – and perhaps the level of knitter your pattern is aimed at! 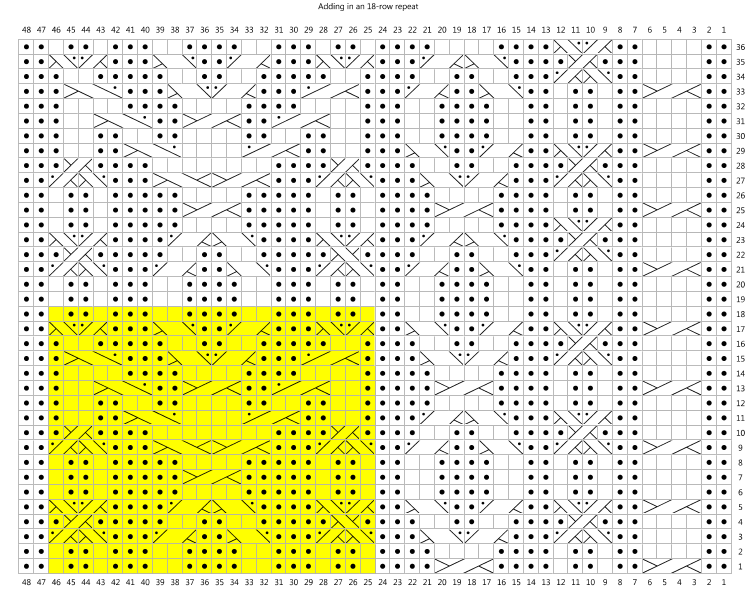 But to me either solution is clearly better than the 48-stitch, 36-row chart above.